The absorbency of textiles can only be clearly optimised with efficient hydrophilic products. 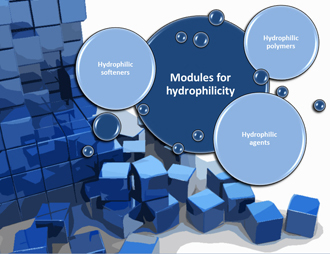 Hydrophilic properties can be achieved with various modules. Versatile effects can be obtained with hydrophilic softeners but also with polymers and hydrophilic agents. The CHT Group offers comprehensive and innovative components with various combination possibilities. This results in highly flexible applications which meet every demand. Further information and more detailed application fields can be found on the product pages or in the brochure. Our staff will be pleased to help you when implementing new finishing effects.